Since 2006 I have been working on the Homeless Shelter Directory. During this time I have tried to find good statistics on the number of homeless in the US. In my research I have found that the National Alliance to End Homeless reported in Jan 2009 that due to the recession, they are estimating that there will be an additional 1.5 million Americans homeless over the next two years. They have their calculation in this report, Homeless Increase. The National Coalition for the Homeless provides the standards for statistics for the homeless in the US. The breakdown the homeless population as Homeless Families with Children, Homeless Youth, Homeless Veterans and Elderly Homeless. There are many statistics in their reports and if you have time, I recommend you try to give it a good read, National Coalition For The Homeless Statistics. I have also read about how HUD creates homeless statistics, This number was calculated using HUD (U.S. Department of Housing and Development) rules. HUD rules require homeless coalitions nationwide to track homeless people during a 24-hour period in one of the last 10 days in January. From what I can understand, HUD works in conjunction with the National Coalition For The Homeless. I guess when it comes down to it, finding an exact number of homeless persons, albeit alarming, is not the point. The fact is that I cannot leave my house without seeing homeless people. I am sure this is true about our country at this point. At this point in our nations history, this still astounds me. Why are we spending billions on a space program when we should be helping our own. Please don't forget about helping out the homeless in your area. 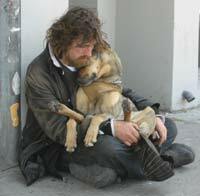 All I can ask is that after the holiday season many forget about the homeless. Please don't forget them and try to help them out every once in a while. Every little bit helps.